Benny Andersson began his musical career in 1963 in the pop group HEP STARS which was by far the most popular group in Sweden between 1963-68. He began writing songs in 1965 and almost all of these climbed up the lists with a little help from his friends the Hep Stars. Gradually he came to spend more and more of his time composing. Especially after he met Bjorn Ulvaeus at the beginning of 1966. The two of them together have written more hits in the past five years than anyone in Scandinavia. Benny has previously taken part in the competition to represent Sweden in the Eurovision Song Contest three times. In each case the songs he has written in conjunction with Bjorn Ulvaeus and Stig Anderson have sold most of all the competing tunes. In the summer of 1969 Benny met Frida at the same time as Bjorn Ulvaeus met Anna Faltskog. The personal relationships plus Bjorn and Bennys composition has led quite naturally to the very close co-operation which the four friends have had during the past two years. Hes the cool, relaxed one in the ABBA four-some. He also smiles a lot from his position off center stage. A knowledgeable grin. And, often, also a grin of satisfaction. Göran Bror Benny Andersson, you see, is one of the two main contributors to the groups spectacular success. A song writer turned stage performer. Music was a daily commodity already in Bennys early years. Both his dad and granddad were enthusiastic accordeon players. Benny was given an instrument of his own on his sixth birthday, and proceeded to push its knobs and buttons until he could copy some of the Swedish folksongs he always heard around the house. Thats the kind of ears Benny always had: un-trained but sensitive. Hes learned his craft by trial and error. – Never took any formal music lessons in my life, he concedes. Maybe two or three hours of piano way back in school-but it bored me stiff. Music to me should be F-U-N! Bennys joy in making music has been contagious. You may not know it, but the success of ABBA is really Bennys second claim to fame. The first time around was back in the late Sixties, when all of Scandinavia rocked to the music of the Hep Stars. An exuberant teen aggregation that succeeded in churning out some 15 or 20 local "monster" sellers. Most of them-you guessed it!-penned by a certain Göran Bror Benny Andersson. In retrospect, Benny had rather not talk too much about the musical abilities of that group. But they had f-u-n, and they knew how to make people feel good. The Hep Stars Saga came to an abrupt end. The group and their production company both broke up. Finances were in a shambles, for the simple reason that nobody had bothered to pay taxes. Benny admits that everybody involved was very young and very careless. But the Scandinavian newspaper headlines surrounding the bankruptcy taught Benny a lesson: there has to be strict management if you want to survive in the music industry today. – In four years I had paid all my tax debts, Benny remembers. And these days, Ill go as far as to say that our whole record company operation is a sound and very well organized outfit. – And make no mistake about it: our tans record buyers and concert audiences will benefit from a well kept "home office: When we go on tour, we want to be able to give the public nothing but the best. Agnetha, married to Bennys long time friend and co-composer Björn-and Frida. According to Benny, who invariably understates his own contributions to the ABBA string of hits, the girls are maybe the main reasons for the very special ABBA sound. It all started in November, 1970, Benny recalls. Björn, Benny and a couple of musician friends needed a few girl singers for a short term cabaret engagement in Gothenburg, Sweden. Frida and Agnetha got the gig. But a few more years were to pass before the four-some dared to concentrate on their own thing full time. One inevitable question these days seems to deal with responsibilities: whos doing what in the Benny and Björn partnership? Where does Benny end, and Björn begin-or, if you will, vice versa...? Benny says he honestly doesnt know anymore. But Frida and Agnetha were, of course, part of Bennys and Björns lives long before anyone came up with plans for forming a group together. If you believe in pigeon-holing people, filing them under neat catchphrases – well, then Benny is the cool, laid-back one in ABBA. But the fact remains: Gören Bror Benny Andersson, to quote his Swedish passport, is, at 32, a seasoned, secure and sensitive guy endowed with an enviable inner strength that immediately puts both new acquaintances and old friends at ease. Most nights, some of that strength shines through even from his seat off center stage. It’s not at toothy, showy type of “hi folks, look-at-me-here-I-am!” kind of smile, It’s a knowledgeable grin, most of the time emanating from his own joy of music making. But then, Benny is one of the two main contributors to the ABBA success. With Bjorn, he writes the songs. He’s the song writer turned performer – not the other way around. With Bjorn, he knows what’s going down musically. And when everything feels just right, you can catch that knowledgeable grin. You won’t find him faking that smile. To Benny, music is serious business; regardless the plethora of joyful, ear-catching, rocking and/or lilting ABBA string of hits, an ABBA show is never a slapdash, let’s-see-what-happens-tonight kind of affair. But music wasn’t always an organized group effort for Benny. He grew up lugging an over-sized accordeon around. Both his dad and granddad were enthusiastic “squeeze-box” players, and Swedish folk songs were always heard around the Andersson house. Benny taught himself by trial and error, same as he’s proceeded most of the time since then. – Had maybe one or two formal music lessons early on – but they bored me stiff, he concedes. Music should be spelled F-U-N. In school, Benny graduated to the piano. Soon, he went his own way to have f-u-n with music. His father, a construction engineer, may have had other ideas, but Benny tended to drift towards this teen club close to the Andersson house in a Stockholm suburb. By the mid-Sixties, Benny was part of the Hep Stars, an exuberant, in all of Scandinavia wildly popular group that flowered for some seasons. The band had some 15 local hits to their name when the group faded, most of them – you guessed it! – penned by a certain Göran Bror Benny Andersson. – A fun period, Benny reminisces. We were very young, climbing amps, shaking heads and limbs like mad. A much-publicized bankruptcy ended the Hep Stars career. Benny went into freelance music making in and around Stockholm with the knowledge that his next venture, any venture, would have to be a pretty strictly organized set-up. ABBA today is very much a well-kept shop. Benny may still feel slightly dizzy when thinking about the groups overwhelming impact world wide. But he’s convinced that both record buyers and concert audiences benefit from a well run “home office”. To Benny, a good part of “the best” means the up-front singing of Anni-Frid and Agnetha. According to Benny, who invariably tends to understate his own composing contributions to the ABBA hit parade of the last seven years, the girls are maybe THE reasons for that very special ABBA sound. – You may see me having a ball up there tonight, he says. You may even hear me sing some background harmony. Be that as it may. But any ABBA song is also the result of painstaking studio know-how, Benny and Bjorn sometimes spending weeks trying different ways to phrase just one little passage. These days, they have one of Northern Europes classiest studio set ups in downtown Stockholm, with facilities that have accommodated even heavy metal guys like Led Zeppelin. Benny says he honestly doesn’t know anymore. – We sit around, preferably out on our Summer island in the beautiful Stockholm archipelago. We toss bits of melodies around, dressing them up with nonsense syllables. Since we dig the same kinds of music – The Eagles, Elton John, Paul McCartney, well most anything with a good strong melody to it – well, then we also seem to react to our little “inspirations” and “inventions” the same way. – Mind you, it is getting somewhat more difficult to come up with new material. You need outside inspirations. Like last Winter, we went to the Bahamas and Florida for a couple of weeks. Not only to get away from our snowy, chilly Swedish climate, but to hear music. To Benny, the US part of the ABBA -79 World Tour, is probably the most challenging. – Of course, it’s a dream come true to us. Over the past years, we’ve done some guest shots on TV, public relation tours. We’ve visited deejays for interviews. We’ve even had some feature exposure, most recently the UNICEF gala from the UN building and a Olivia Newton-John special. – But not matter how “big” we might be in the rest of the world – being able to make it in the US would be the icing on the cake! 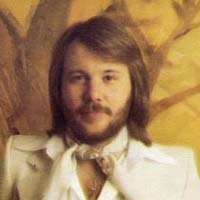 Göran Bror Benny Andersson was born December 16, 1946 in Stockholm, and spent much of his youth in the suburb of Vällingby. Music entered Benny’s life when he was very young. At the age of six he got his first accordion and started playing together with his father Gösta and his grandfather Efraim. Benny also learned how to play the piano. He became a member of The Hep Stars in October 1964. The following year the band achieved their breakthrough and quickly became Sweden’s number one pop group of the 1960s. In 1966, Benny had a chance meeting with Björn Ulvaeus, himself a member of the folk group the Hootenanny Singers. They hit it off and wrote their first song together, ’Isn’t It Easy To Say’. In August 1969, Benny left The Hep Stars after a turbulent few years of financial problems and musical differences. Instead, he intensified his working relationship with Björn. The pair was writing songs for other artists and also started recording as a duo. Around the same time Benny met Anni-Frid ”Frida” Lyngstad and got engaged to her – they were eventually married in 1978. In November 1970, Benny, Frida and Björn staged a cabaret show together with Björn’s fiancée, Agnetha Fältskog. In 1972, the first ABBA record was released, and Benny was occupied by his work with the group for the following decade. In 1983 he started working on the musical Chess together with Björn and lyricist Tim Rice. A concept album was released in the autumn of 1984, and in May 1986 the musical opened in London’s West End. In 1988 Chess received its Broadway première. A reworked version of the musical opened in Stockholm, Sweden in 2002. By 1990, Björn and Benny had decided to write a new musical, based on the Emigrants novel series by Swedish author Vilhelm Moberg. The musical Kristina från Duvemål (Kristina From Duvemåla) opened in October 1995. The show ran for three and a half years at various theatres in the Swedish cities of Malmö, Gothenburg and Stockholm. Parallel with this, Benny has released three Swedish solo albums. While Björn Ulvaeus has been heavily involved in the ABBA musical ’Mamma Mia!’, Benny has kept his commitment on a lower level. He has instead been busy composing songs for the stage, the cinema and even an official Swedish hymn. In 2001 and 2002 he has enjoyed success with Benny Anderssons orkester ("The Benny Andersson Orchestra"), topping the Swedish album charts and performing a select number of concerts in Sweden and abroad. Written by Carl Magnus Palm for ABBA - The Site 2002.